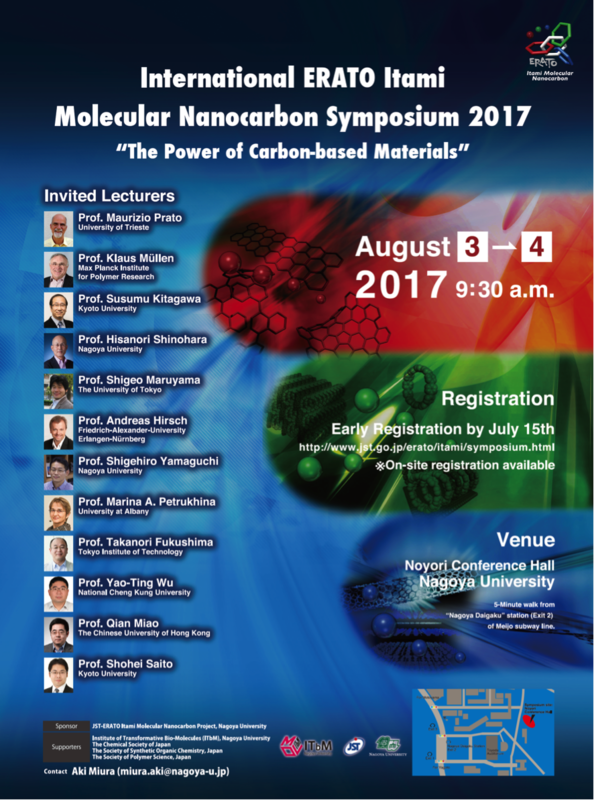 The International ERATO Itami Molecular Nanocarbon Symposium 2017 "The Power of Carbon-based Materials" will be held on August 3-4, 2017 at Nagoya University, Japan. This symposium will focus on recent achievements in the synthesis, utilization, and analysis of structurally well-defined nanocarbons and related materials. Please register at the following link by July 15th. The JST-ERATO Itami Molecular Nanocarbon Project was launched at Nagoya University in April 2014. This is a 5-year project that seeks to open the new field of nanocarbon science. This project entails the design and synthesis of as-yet largely unexplored nanocarbons as structurally well-defined molecules, and the development of novel, highly functional materials based on these nanocarbons. Researchers combine chemical and physical methods to achieve the controlled synthesis of well- defined uniquely structured nanocarbon materials, and conduct interdisciplinary research encompassing the control of molecular arrangement and orientation, structural and functional analysis, and applications in devices and biology. The goal of this project is to design, synthesize, utilize, and understand nanocarbons as molecules. JST-ERATO Itami Molecular Nanocarbon Project "International ERATO Itami Molecular Nanocarbon Symposium 2017"
JST-ERATO Itami Molecular Nanocarbon Project "Symposium Program"
Registration is free. Please register by filling out the registration form.